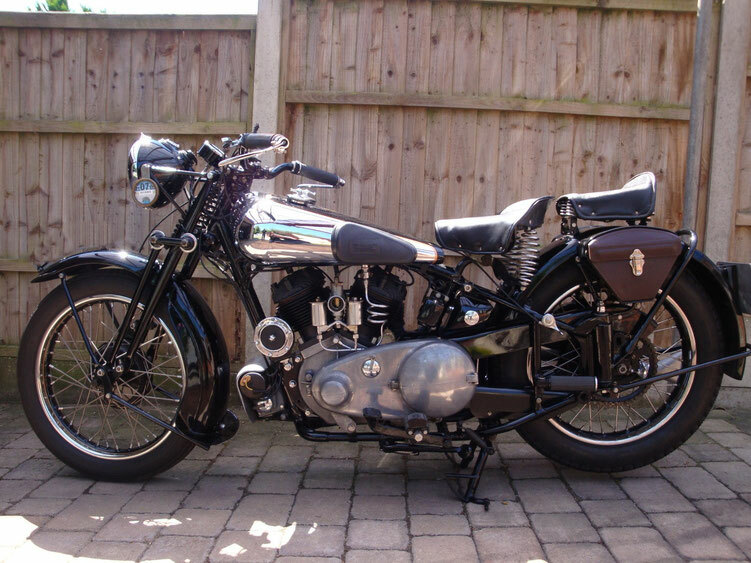 1919 Following an argument, George Brough left his father's Brough works to set up Brough Superior in Nottingham. From the outset his machines were built for the connoisseur who appreciated the best available in style and workmanship. Although he used other firms' products, he was able to persuade his customers that those supplies were better and special to the normal line. 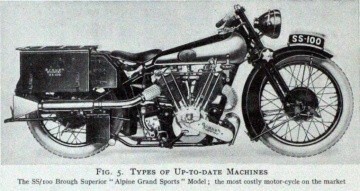 1920 In December, the press revealed the first Brough Superior as a magnificently strong, curvaceous machine. This was to be the hallmark of the brand throughout its history. 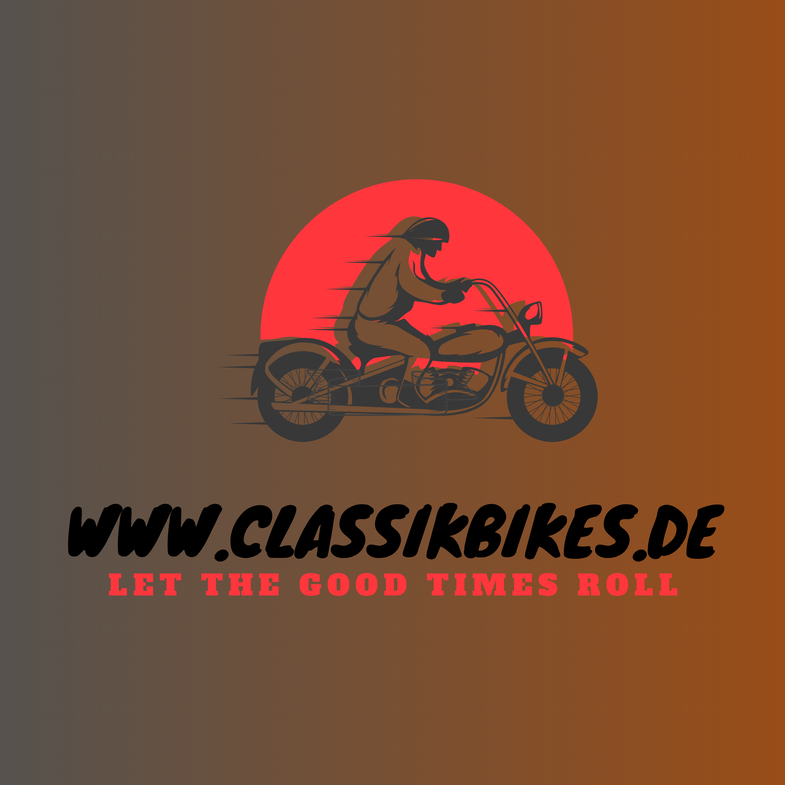 It had a 986cc ohv JAP V-twin engine, three-speed Sturmey-Archer gearbox, Amac carburettor, ML magneto and a strong frame with Montgomery forks. The finish of the machine was of the finest quality and almost every piece on them was hand made: nuts, bolts and fittings. There was also an alternative option of the Swiss 733 cc ioe MAG V-twin engine, or the larger 993 cc MAG. Another alternative as the 999cc Barr and Stroud V-twin sleeve-valve engine. 1922 An alternative 976cc JAP sv engine was an option. 1923 The model line was revised and the 988cc sv JAP V-twin engine made its debut. It could power the machine to around 80mph/130kmh, and keep it there all day. 1924 Until now the braking system had been the weak point in the design. The brakes were changed to drums in both hubs, and as a reporter had dubbed the model 'The Rolls-Royce of motorcycles', Brough used this accolade to boost publicity. With the JAP engine came the three-speed Sturmey-Archer gearbox, modified Harley-Davidson bottom-linked forks and a stylish tank. Capable of reaching 100mph, this was truly the first 'superbike'. 1932 By this time many more models had been produced and/or revised and modified. George persuaded Herbert Austin to supply him with bored-out Austin Seven 800cc engines, fitted with an alloy head and he overcame the problem of having to offset the rear-wheel drive by fitting two rear wheels - one either side of the prop shaft. With shaft drive it was intended for sidecar use. Shortly after this, William died and George returned home to continue his production. 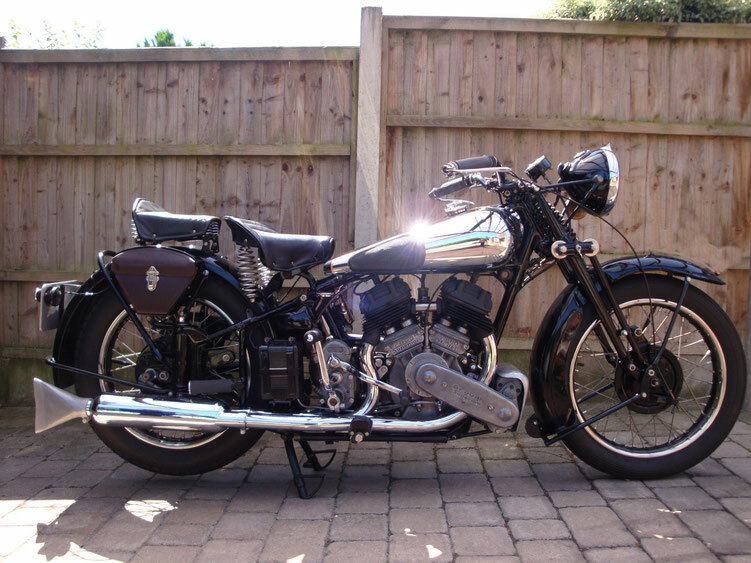 1935 A revised SS80 model was produced powered by a 982cc sv Matchless V-twin engine engraved with the name Brough Superior. (T.E. Lawrence (Lawrence of Arabia) owned eight Broughs, all called George. He was killed on May 13, 1935, while riding George VII, an SS100. 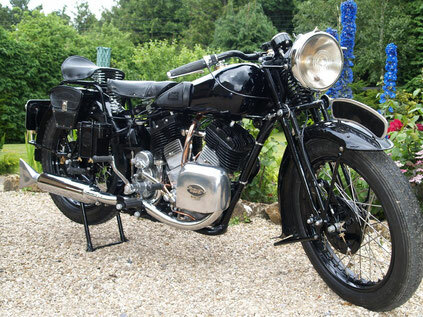 Only around 400 SS100s were ever made; about 300 powered by a JAP engine, the last 100 by a Matchless V-twin). 1935 Producedf a car nased on the Hudson. Around 25 produced. 1938 Brough exhibited his four-cylinder Golden Dream. Two of these were built, and the golden finish of one gave it its name. The cylinders were arranged as a transverse-four layout and did not need water cooling. The outbreak of war prevented development of this model and it never went into production. 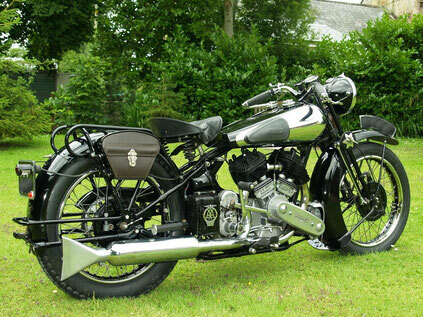 1940 Wartime brought all production of motorcycles to a close and the engineering works turned to the war effort. The capabilities of the factory to produce high-precision engineering resulted in the supply of Merlin crankshafts for Rolls-Royce. 1949 Noel Pope used an enclosed, streamlined Brough with an 8/80 JAP engine to try for a speed record on the Bonneville Salt Flats in Utah. He crashed at 150mph, ending his attempt. Pope had already achieved a world record on a Brough at Brooklands, where he reached 124 mph in a solo and 106mph in a sidecar machine. But the record went to Eric Fernihough in 1938, who managed to reach 180mph on a Brough in Budapest, but was killed in the return lap.